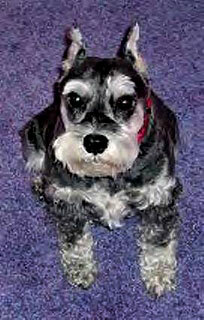 Pookie loved swimming, eating Stella D’oro Swiss Fudge cookies, playing with stuffed animals (he had soooo many! ), drinking fresh spring water instead of tap water, playing in the hose, keeping his dad company while he worked on the lawn and landscaping of the house, sitting on the back of the couch to look out the window (which he was never given permission to do), playing in the snow, chasing squirrels, and getting a lipstick kiss from his mom every morning before she left for work. Pookie hated having his toenails cut, walking near a sewer grate in the street, sharing his stuffed animal toys, and eating pretzels. He had his own birthday party when he was five, complete with a bone-shaped peanut-butter flavored cake with yogurt icing from the dog bakery. We’ll always remember going to pick up that cake and seeing it rotating around in the bakery case with “Elvis 5” written on it!